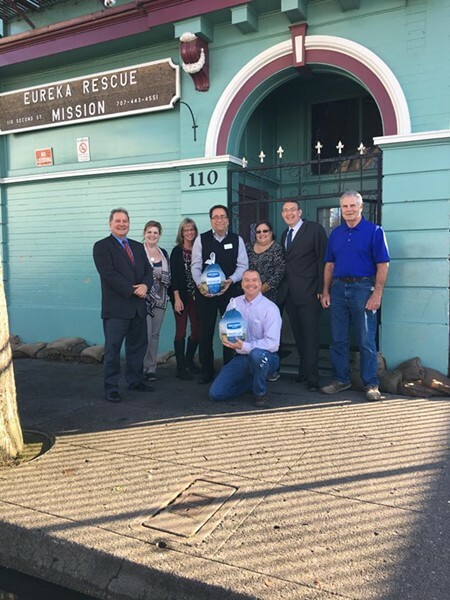 The Rescue Mission's industrial freezer was too full to walk into earlier this week, thanks to the donation of 110 turkeys from the Rotary Club of Eureka. Rotary president Matthew Owen said he put the call out to Rotary members after finding that the shelter only had 10 turkeys to feed the 100-plus people expected at their holiday dinner. On Monday Rotary members arrived with a truck full of frozen turkeys, which were purchased at a discount from Safeway and Grocery Outlet. Bryan Hall, executive director of the Mission, expressed his gratitude on Facebook, posting the video including below and saying, "Thank you, thank you, thank you!" 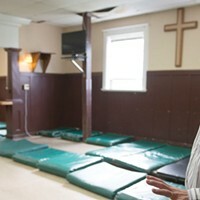 On Nov. 20 the Mission provided shelter for 153 men, women and children. Hall added that they are still in need of coats and gloves. Many people come to the Mission for dinner but then return to the chill of the night, and Mission staff try to outfit them with warm clothing and hygiene kits before they go. The Mission's holiday dinner takes place the day before Thanksgiving. Just down the street, St. Vincent dePaul's dining center was preparing to feed around 500 people on Thanksgiving Day. The center's cook, Mary Price, said they had received 12 hams and 27 turkeys, enough to tide them over until Christmas. Community donations of hams, pies, vegetables and other food are still welcome up until 11 a.m. on Thanksgiving day, when the feast begins.